I love coming across really interesting homeschool goodies. 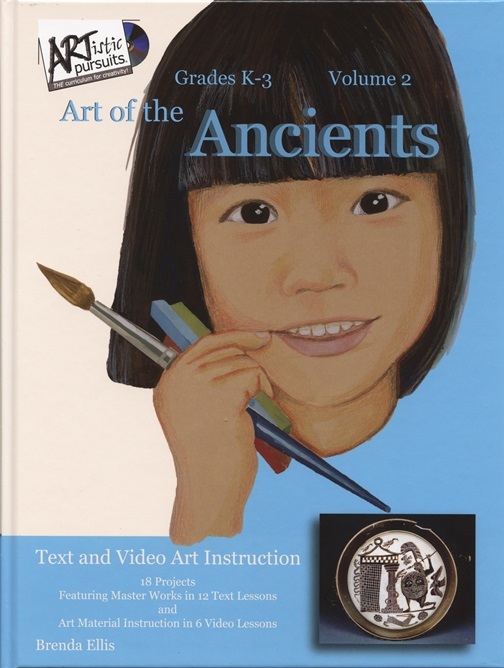 That's why I was so excited to find this new gem by ARTistic Pursuits Inc. We were sent a physical copy of ARTistic Pursuits Art Instruction Books with DVD and Blu-Ray to try out the Art of the Ancients. This is intended for ages K-3rd grade, but I knew Mr. B would still enjoy this, and benefit from it at age 12. My idea was to use this along side an Ancient History study so that he could incorporate art into his lessons. Clever, eh?! Included with the book is a DVD and a Blu-Ray disc that feature video lessons. The video lessons bring to love the art lessons within the book, and showcase how these lessons apply to the world in which we live. I was rather impressed with the video lessons. Mr. B and I really enjoyed working through this together. I did not go out and buy materials. I wanted to see what all could be done using just what we have here on hand. This thought led me to realize we have a lot of arts and crafts materials in this house that we really need to use! Mercy sakes! How much colored tissue paper does one family need?! Apparently 1.2 Kajillion sheets of it, that's how much! Anyway, I love showing how things can be modified for your unique homeschool, so that's kind of what I did here. We sough to use what we had on hand, which is pretty much what other homeschools would have-Crayons, colored pencils, markers, tissue paper, construction paper, paints, etc. I did not have clay on hand, and I really thought I had play doh too...but alas I did not. I guess I could have been all kinds of crafty and MADE playdoh, but instead we sort of just skipped over that lesson with the intentions of coming back to it when I make a trip out for clay. Now, here's a disclaimer-I LOVE ART. So I do have things like pastels, high end chalks, pastel and chalk specific papers, etc. Those may be items you don't have on hand that I would suggest you purchase-and not necessarily and expensive set. Just something because you can't really duplicate soft pastels. You will also want clay, some brown paper bags or brown paper, and black paper-but you could use any colored paper. 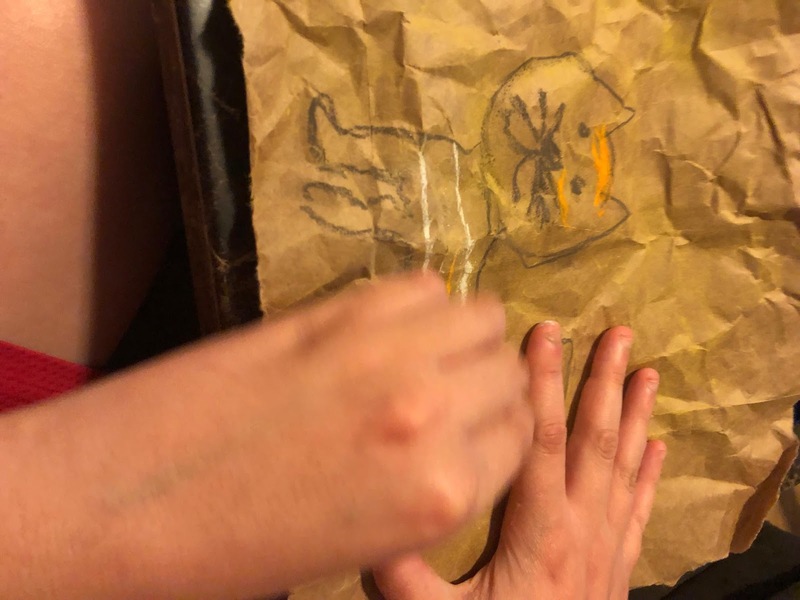 There's a project where your child needs to draw the outline in white, so colored paper is needed. Here's a photo of the Contents page so you can get an idea of everything that is covered in this book/DVD/Blu-Ray set. Each section includes a small history lesson, as you can see below. This was really interesting. We have been fortunate enough to have had the chance to see, first hand, a traveling exhibit of Pompeii artifacts. The mosaic murals are amazingly beautiful, even today! I appreciate the real photo directions. This is really beneficial to kids like Mr. B who are on the spectrum and need that visual boost to help them figure things out a bit. Below are photos of a couple of our projects. I lucked out and found a brown paper bag. We usually have a stash of lunch bags on hand for crafts, but I couldn't find them. I found 1 bag, and that's all we needed! 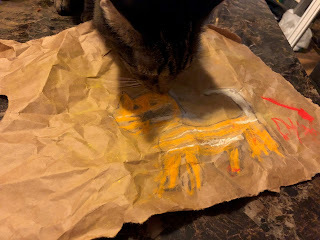 I helped Mr. B draw the cat. The idea here is to crumble the paper to mimic the rough surface of a cave wall. Both of us were surprised by just how difficult the crumbling made the task of drawing! Here is Edwin the cat checking out the portrait of one of his ancestors. He approves. 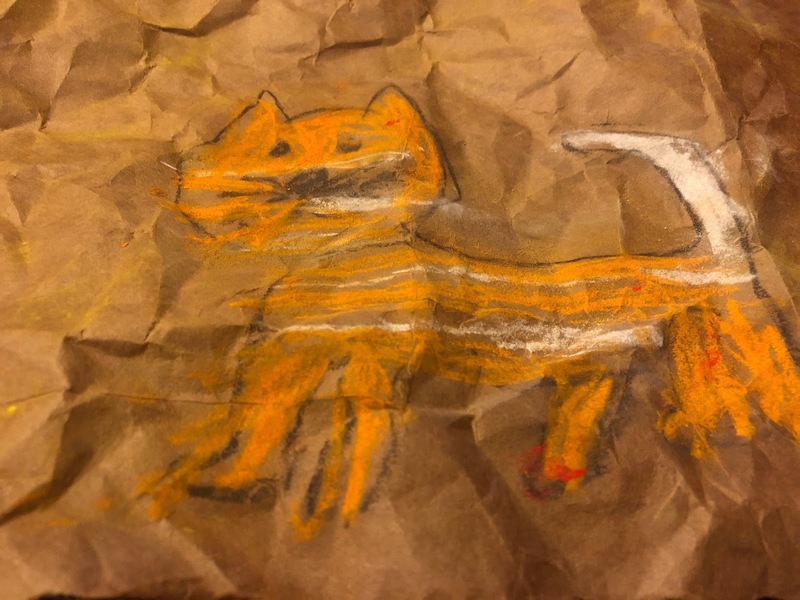 And here is Mr. B's finished Cat. Next we thought we'd do some Mosaic work. I wanted to use a variety of mixed beans to do the mosaic, but Mr. B wanted to use tissue paper instead. It's a frog getting ready to eat a fly. Overall, we both really like this. It's aged appropriately for the K-3rd grade range. Mr. B still found this useful, and it does make for a nice supplement to his ancient history studies. The videos are short, but long enough to cover the given topic. I think the addition of the videos really sets this series apart from other Artistic Pursuits books, and I personally found them very helpful. We both like to see how we are supposed to do things, instead of reading how. All in all, I would recommend this to others! 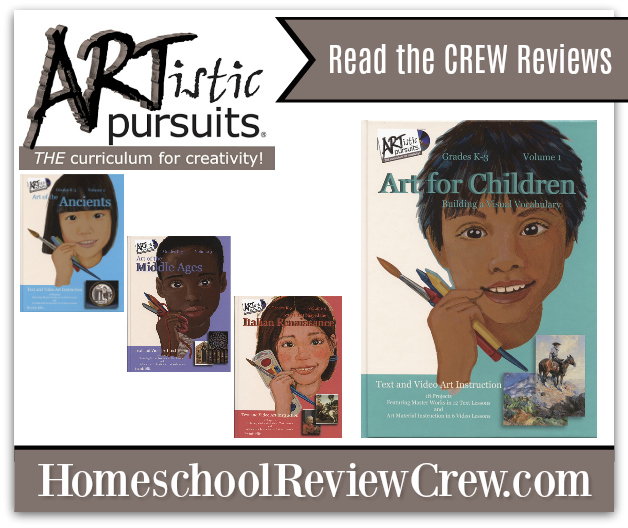 \ Please click the banner below to read more Homeschool Review Crew REVIEWS! The crew received a variety of different genres, so please go check those out!